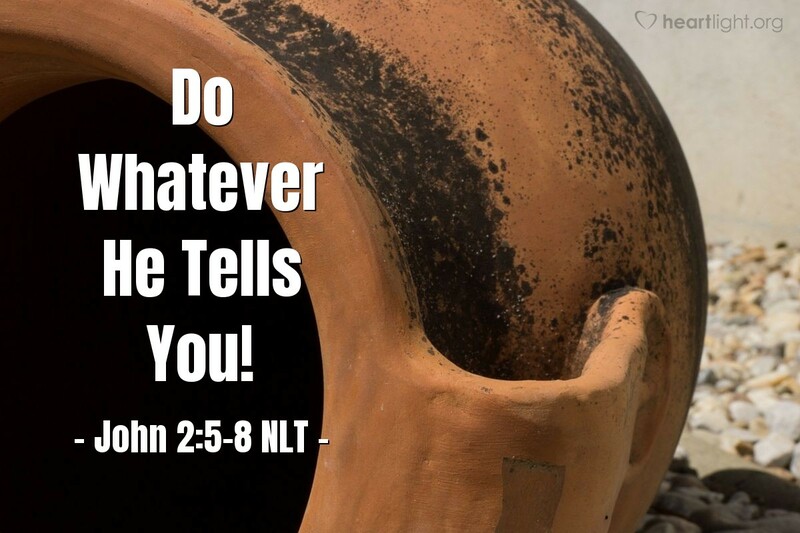 But [Jesus'] mother told the servants [at a wedding celebration], "Do whatever he tells you." Standing nearby were six stone water jars, used for Jewish ceremonial washing. Each could hold twenty to thirty gallons. Jesus told the servants, "Fill the jars with water." When the jars had been filled, he said, "Now dip some out, and take it to the master of ceremonies." So the servants followed his instructions. "Do whatever he tells you," Mary told the servants. Her voice rings out over the centuries. The servants' example of obedience transcends water turning into wine at an ancient wedding (John 2:9-10). When we do what Jesus tells us to do, even if we don't understand why he asks it, we get to see God's glory. Sure, this story is about a wedding and a hugely embarrassing wine shortage. Mainly, however, it's about Jesus doing greater things, better things, than we can do or even imagine. So let's do what he tells us. The words of Jesus that John will share with us will not just be good advice, but they will be "spirit and life" (John 6:63). Let's not only listen with our ears; let's listen with our lives. Father, give me eyes to see and ears to hear what Jesus tells me to do. I want to be courageous enough to live up to what he asks of me. I want to be willing to do WHATEVER he tells me, even if I don't understand it. Empower me with your Spirit to that kind of faith and courage. In Jesus' name. Amen.